Hacienda Santa Rosa, A Luxury Collection Hotel, is a former 17th century manorial house with carved columns and ornate gardens, immersed in the Mayan community. It was lovingly restored in 1998, using traditional techniques taught by locals knowledgeable in this ancient proficiency, and using local materials, such as paint minerals. The original buildings and spaces were repurposed and adapted to serve as a luxury boutique hotel, offering opulent comforts and modern conveniences, while celebrating and highlighting its Mayan past. The ancient service buildings were converted into delightful guest suites and the old water tank is now a tranquil swimming pool. Spend an afternoon discovering the life of the Mayans – the historical and contemporary. Stroll through local villages and explore unique boutiques of talented artisans. Indulge in a massage amongst garden greenery, performed by talented masseuses with indigenous products. Wake up to the chirping of birds and enjoy a deluxe breakfast by the pool with botanical garden views or in the privacy of the suite's garden. Unwind in one of the 11 unique guestrooms or suites with hand-carved wood furniture and enjoy flawless Mexican hospitality. 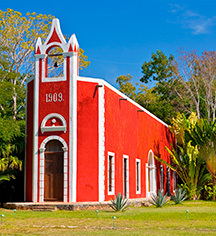 Hacienda Santa Rosa, a member of Historic Hotels Worldwide since 2016, dates back to 1897. The 99 sq ft / 9.2 sq m botanical garden is set amidst an old fruit plantation and features over 200 species of plants, several of which are endemic to the Yucatán Peninsula. Hacienda Santa Rosa, A Luxury Collection Hotel, is a former 17th century manorial house with carved columns and ornate gardens, immersed in the Mayan community. It was lovingly restored in 1998, using traditional techniques taught by locals knowledgeable in this ancient proficiency, and using local materials, such as paint minerals. 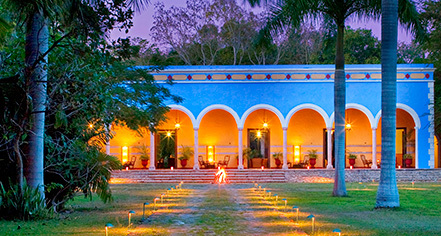 Learn more about the History of Hacienda Santa Rosa, A Luxury Collection Hotel .